Whoever decides on new store openings for Sainsbury’s may well have recently moved to south east London given just how many are opening up shortly. There’s shops planned for Abbey Wood, Charlton, Woolwich and Lewisham. Firstly, we have the large superstore at Abbey Wood, as part of Cross Quarter. I’ve had emails in the past inquiring whether I had any information on how to apply for jobs. It looks like Sainsbury’s have now started advertising both for both here and their large Charlton store (more on that in a bit). Click here and search for either town to see the jobs available. Photos courtesy of Brian Barnett. 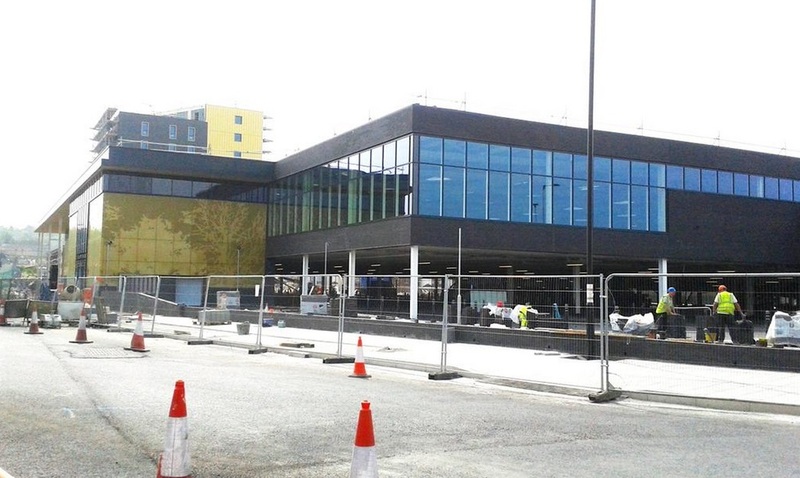 Both Abbey Wood and Charlton superstores are due to open by the end of July. 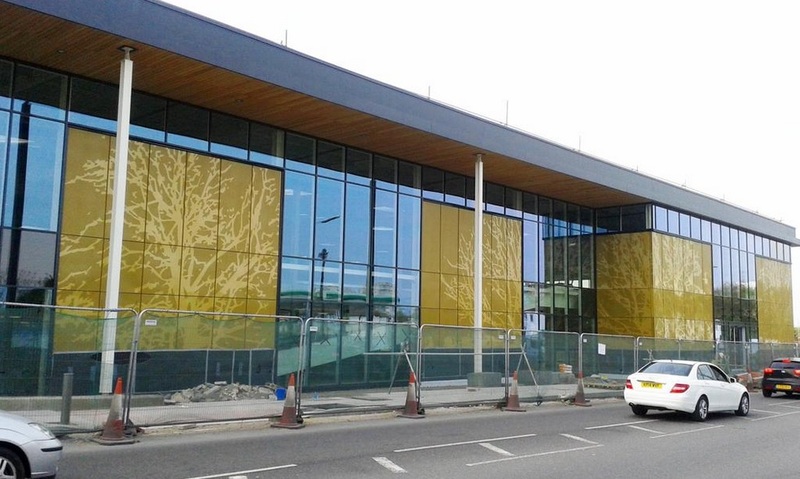 At Abbey Wood gold, perforated metal cladding featuring images of trees have been applied, referencing the woods up the road. I’m not entirely sure about it in pics and will have to see in person. Car parking is below the shop. Temporary traffic lights have led to long queues. A permanent crossing will appear when work is finished. Add in thousands of new homes planned to be built around here, plus shoppers arriving by car, and it could become very busy requiring work in future. The road is the main route from Thamesmead to Abbey Wood station. The controversial block of flats can be seen behind in the top photo, but unfortunately there is no housing above the store. 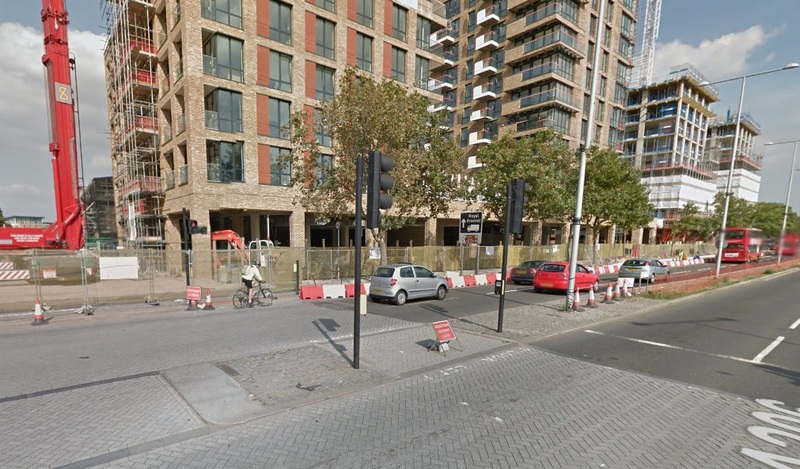 This will be seen as a big mistake pretty soon, being two minutes from the Crossrail station. Paving outside looks pretty narrow and I see no sign of the segregated cycle shown in renders when in planning. I hope post-approval alterations didn’t removed it, and given the green light by the planning department. Charlton’s branch is also a superstore but has huge car parking beside the shop instead of below. I’ve wrote about what a huge waste of land this is, located just five minutes walk from Charlton station, and should have included a residential element. Greenwich council’s masterplan for the area predated the store by a couple of years and specified retail only. The additional traffic is sure to place more strain on the road network, with many other retail barns also opening soon nearby. The cladding here is timbre rather than metal paneling and looks better to my eye. Unfortunately once again, there appears to be no separate cycle lane outside. A painted strip is it. 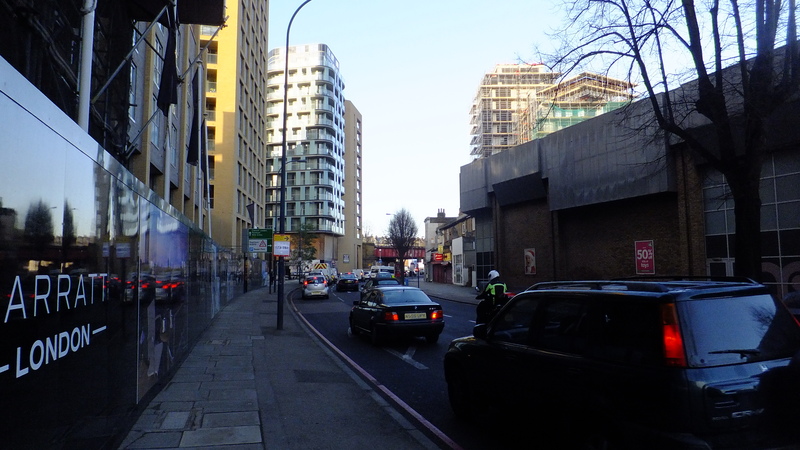 London must do much better than this, with major developments that have very long road frontages adopting lanes outside where at all possible. With such a huge site footprint this should be easily attainable, and on-foot entrances designed in such a way to avoid conflict. At it’s western end, the store meets two Victorian hold-outs quite incongruously. Other stores opening in future are at Woolwich and Lewisham. 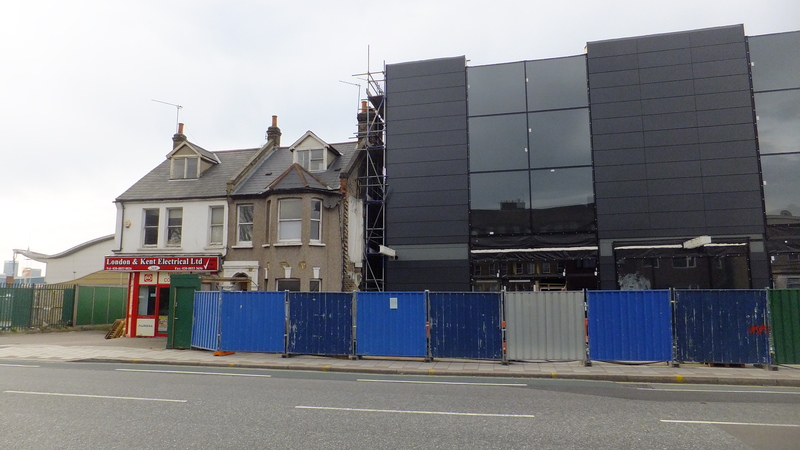 The shop at Woolwich will be below a recently completed block of flats on the Arsenal site, beside the Crossrail station and facing Plumstead Road. Given the large population and housing increases in Woolwich it’s quite possible they retain the existing store and both will co-exist. This whole stretch lacks a cycle lane forcing cyclists to dice with cars and buses pulling into and out of stops. The Lewisham branch will be at Barratts’ ‘Renaissance’ development on Loampit Vale. The store will be located below the many new flats built here. Again, the added population should allow existing stores to continue trading alongside. Whilst I’m glad to see supermarkets opening in high density housing developments, as opposed to sprawling out-of-town sites incongruously placed near inner London such as Charlton, the lack of cycle lanes pop up again at this development, despite ample space on wide pavements to provide them. A stubborn refusal to build segregated lanes across London (with limited high profile schemes often the only exception) will prevent many giving cycling a go and instead onto overcrowded trains. Uncomfortable they may be, but not as dangerous and off-putting as many roads in London. Opposite Sainsbury’s a new Asda will also be opening on the ground floor of ‘Thurston Central’ – a 406 flat development now almost complete externally. This was originally penned in as a B&Q but falling sales have led to store cut-backs. The same thing has also afflicted many supermarket groups, at least for larger stores, but the two large stores at Abbey Wood and Charlton seem to have scrapped through just before the change in policy. I wonder why flats, that were considered so community damaging after the massive building programme in the 60’s, are now considered acceptable? Just how many extra people can you cram into one area when there aren’t the back up services to support such a massive population increase? People with young children are worried about the school places, whilst the – now few and far between – hospitals are struggling to cope. Do planners ever take that into consideration? Thanks for keeping everyone up to date – you do an amazing job. Thanks for the update. Does anyone know the square feet/metres of each of those new stores? I assume the new Sainsbury’s Charlton store will be like the one in Crayford, which I think is a great example of how a hyper-store should be managed – a bad example being the Tesco’s in Woolwich, which is a store I nearly always end-up regret having visited (I never learn! ): lack of stock and staff who don’t know where basic things are etc. I do find that electrical shop quite amusing as it’s clearly an “up yours” to the developers. I wonder if they’ll ever give in? 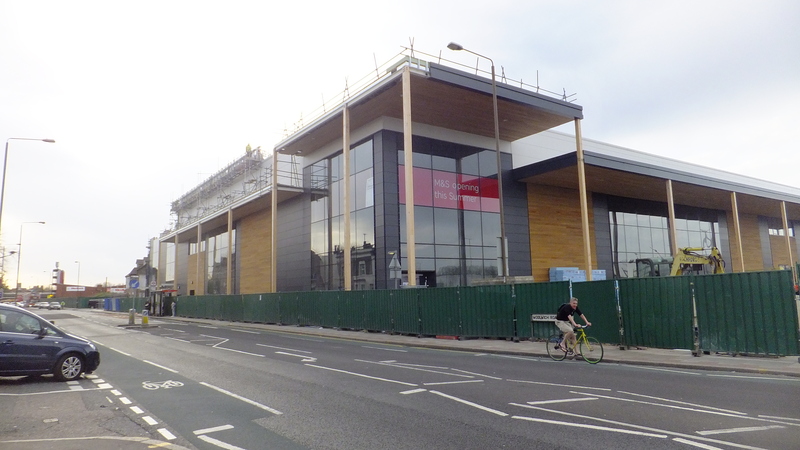 The front of the new Charlton store looks far better when viewed from Bugsby’s Way rather than Plumstead Road. I do worry whether the new Sainsbury’s stores in Abbey Wood, Charlton and Woolwich end-up cannibalising the existing store in Calderwood Street, which is a store I actually like using. Given the demise of the M&S store in Woolwich (now a 99p shop 🙁 ) I’m pleased M&S is opening a bigger and better store in Charlton. Agree that it does look like the roads need to be upgrade to cater for the extra traffic. On the plus side the new Sainsbury’s is sufficiently close to Charlton rail station to make me think that I could visit the store by train rather than bus. The one in Greenwich was too far from Charlton or Westcombe Park stations IMO. Thanks Andrina – good to see you commenting again. Impact on infrastructure should be considered but the UK system is pretty fragmented and lacks long term planning and strategy. The planning permission for Abbey Wood Sainsbury’s stated the road would be at absolute capacity when it opens. Did that account for Crossrail, the additional homes Peabody are now building within walking distance as well as in north Thamesmead, let alone other shops planned for the road? We need much more housing and in busy cities flats serve an important role but the UK needs to do it as many other nations do – maintain well and not let areas and blocks decline through neglect (very common in UK) and be very firm on anti-social tenants. It only takes one to affect many and a spiral can begin. Also ensure good standards in terms of room size, natural light, storage space etc. These were abolished by the tories in the ’80s, labour did little in 13 years and now the tories are again talking of starter homes with no regulations, so expect small windows, little natural light, tiny rooms etc. The UK already builds some of the smallest new homes in the developed world and this will make them worse. It was London mayors (labour and tory) that have done more for home standards (though not housebuilding which is far below what’s needed but not helped by central government). Another reason I believe in power moving from Whitehall/Westinster to London. Plumstead Resident – I believe both Abbey Wood and Charlton are around 80k square feet. Abbey Wood should include a cafe – not sure about Charlton. There was some other numbers mentioned earlier on in planning (45k at Abbey Wood for example) but those seem to be the latest figures. Crayford is 100k or 130k depending on figures (maybe 100k is just food area?) for comparison. Tesco Woolwich is 84k and was originally planned to be 128k sq ft. I don’t think the traffic impact has been fully thought out either; the hold ups will get worse and worse with each new development. As to traffic coming from a new river crossing – well, it certainly isn’t all going to veer off towards Bronze Age Way. Many will take a short cut if they want to access the A2 and the resulting congestion will be horrendous. I understand the need for extra housing, but I still have concerns about the high density of it around the locality (my dad certainly wouldn’t have recognised the old Woolwich Arsenal that’s for sure).